A Maui must! There is truly nothing like sights from the top of Haleakala crater. Bring your sweats & blankets for an early morning sunrise, hike, camp or bike ride down the slopes...a visit to Haleakala is a beauty that every Maui visitor should experience at least once. Another gorgeous historic site on Maui, Iao Valley is a perfect place to enjoy a hike, picnic in the park, or swim in the cool freshwater stream. A sacred place, it is treasured for its historical significance in Hawaiian culture and history, and as all natural beauties on our island paradise, one of which island residents are careful to preserve and honor. One of our absolute favorite ways to enjoy beautiful Upcountry, Maui. Enjoy the drive up Kula highway into Keokea and take a walk, jog or bike ride on picturesque Thompson Road (so beautiful even Oprah has a home there) before a delicious breakfast. Try the coffee & pastries (my daughter can never resist their carrot cake!) at Grandma's Coffee House. The beautiful gallery of our dear family friend and gifted painter, Curtis Cost, whose artwork perfectly captures the true beauty of our island home. Located in Kula, you can enjoy breakfast at the Kula Lodge before a visit to his gallery downstairs. Visit Maui's local lavender farm, perfect for a relaxing Upcountry stroll, amazing local lavender products, or a cup of tea and a lavender scone with a generous spread of our favorite lilikoi lavender jelly. Maui's signature doughnuts are an Upcountry staple. 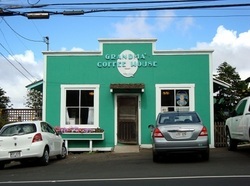 Located in Makawao at the top of Baldwin Avenue, they are a perfect sweet treat and sell out quickly! You can never go wrong with Komoda's cream puffs, anpan, stick doughnuts or chocolate dobash cake. Maui's premiere watercolorist, Sherri Reeve is not only a talented artist but one of my dearest friends. A visit to her gallery is like catching up with old friends, from their unparalleled service to the awe-inspiring artwork that graces her walls. Her work is unforgettable! The best place for an amazing Makawao lunch! Located next door to Sherri Reeve's art gallery, we highly recommend Makawao Garden Cafe for their sandwiches, salads & fresh lemonade for lunch after a stroll through Makawao town. Our family's go to salon for hair, nail & skin services with the finest professionals on the island! Fabulous service, a wonderful environment, and one of the best waxes, pedicures or haircuts you will ever find on Maui. The perfect spot to enjoy the Upcountry weather alongside a delicious, organic meal using the finest local ingredients. Stop in for breakfast, lunch or dinner for a beautiful meal in quaint Makawao town, we love their benedict options for an incredible savory breakfast. The best health food store on the island! Mana Foods is located in quirky Paia Town & is our favorite source for organic Maui produce & local products. Not only can you shop to fill your fridge with healthy goods, but you can enjoy their incredible bakery, deli and salad bar as well! One of our favorite places to enjoy with friends! Not only is Paia a fabulous place to visit for its unique 'hippie' reputation, but its also one of the very best places to eat on the island! Flatbread's ambience is casual cool, and their use of local, organic products makes the experience of their delicious food all the more enjoyable. Cafe Des Amis is another brilliant family favorite. Breakfast, lunch or dinner, nothing beats these scrumptious crepes and curries! Stop in for happy hour from 4-6 daily for half price cocktails (like their fresh lilikoi margaritas) and their exquisite Mediterranean and Indian fare. We can't resist their mediterranean appetizer platter, shrimp curry, Illy coffee and of course all of their sweet and savory crepes. Paia's famous Fish Market! You may recognize it from the many television features it has graced, including Food Network, and for good reason! Paia Fish Market is located on the corner of Baldwin Avenue right in the heart of Paia and truly captures the essence of this wonderful surfer town on the North Shore. Using the best island fish, you can taste the freshness in every bite. The best sweet treat in Paia...who doesn't love gelato?! More rich and creamy than ice cream, and using the best local ingredients on island, it is our favorite place not only for gelato, but for Ono Gelato cakes for family birthdays! This pick is for anyone with a genuine sweet tooth. Maui Specialty Chocolates in Kahului is definitely a one stop shop for our family whenever we travel to the mainland, as their delicacies are a favorite of friends and family alike (especially when bringing goodies to our boys in college). Our tried and true favorite is their chocolate & peanut butter mochi, made fresh daily! Maui's premiere winery in gorgeous Ulupalakua, Tedeschi Winery is a great Upcountry stop for a taste of their delicious local wine made from Maui grapes, pineapple & even their specialty rasperry framboise. The best place on Maui for concerts, art exhibits & wonderful cultural events. We have seen some of the most wonderful performers (including our own children!) grace their stages over the years, and continue to appreciate the versatility that the MACC offers in all of its shows, exhibits and events. Our wonderful local college, University of Hawaii's Maui College does not only offer a wealth of courses educating our local residents, but plays host to amazing events and whose culinary programs boasts fabulous gourmet meals in their Pa'ina cafe...a favorite lunch spot in town my husband & I frequent often. Whenever you see this bright blue sign, you know heaven is near! An island treat, shave ice is a local favorite beloved by my children throughout their childhood, and something they delight in on a hot Maui day. Located in Kahului & Lahaina, Ululani's gourmet flavors (everything from coconut, pineapple, tamarind, bubble gum & even wedding cake), finely shaved ice, fabulous additions (fresh mochi, Roselani's ice cream, tapioca pearls, fresh coconut, sweet cream, adzuki beans or li hing mui) make theirs truly unique and absolutely delicious! For those of you familiar with local foodie favorites, Sam Sato's in Wailuku is a must for their infamous noodles and manju. While saimin is of course a local fav, most prefer their delicious dry mein noodles with a side of broth. Noodle lovers all agree, one bite and you'll be convinced. A longtime favorite family bakery, Stillwells is our family's absolute go-to for pastries. Not only are we big fans of their delicious cafe sandwiches, but everything from their eclairs, cream horns, coconut cake, fruit tarts, and macadamia nut rolls! Located in Wailuku, their sweets have had us hooked for years, not to mention one of our favorite seasonal sweets is Stillwells' Christmas Stollen! Stillwells is a wonderful place to have lunch and a sweet treat (or two!) in town. Another wonderful Wailuku spot, Green Ti is one of our favorite places for a relaxing massage. Their charming boutique carries fabulous local products from lotions, candles, cards and made on Maui jewelry! Their service is excellent and the masseuses truly skilled in their craft...a great way to spend the afternoon, a massage, bit of shopping on Market Street and then coffee from Wailuku Coffee Company! The best source on Maui for true, Hawaiian craftsmanship, Native Intelligence on Market Street in Wailuku offers local products for cultural practitioners and reflect the beauty of Hawaiian culture. They honor and respect the integrity of our local host culture, of which you can find in everything from beautiful hula implements, cards, Hawaiian apparel & art. Truly, there is nothing like Native Intelligence here on Maui. Located on Honoapi'ilani Highway (30) in Waikapu, this wonderful family-owned business boasts what my family feels is the best local food on the island. Their hamburger steak, chicken katsu and lau lau plate lunches are my children's favorite stops when they come home from college and are craving local food.